Stuart's new SC6PLUS Colony Counter adds PC and printer connectivity, as well as LED lighting for greater comfort in longer work sessions. Replacing the popular SC6 model and offering excellent new capabilities at no additional cost, the SC6PLUS is ideal for all microbiology applications, particularly in the food industry. With the latest colony counter Stuart introduces LED lighting. The light is whiter and brighter, making observation easier. 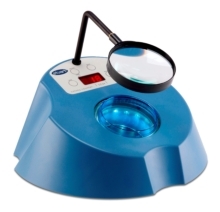 The SC6PLUS is simple to operate, enabling fast, accurate counting of bacterial and mould colonies. Touching a petri dish on the electronic pressure pad with a felt tip pen or probe to mark a colony causes a count to register on the digital display, with an optional tone for confirmation. The black background facility helps when counting difficult, translucent colonies. Commenting on the new connectivity provided by the SC6PLUS, Jackie Taylor, Stuart Product Manager, said, "The ability to connect the unit to a PC means that data can be transferred directly, eliminating any user errors which may arise when manually recording and keying in results. Output can be imported straight into an Excel file, saving additional time. The SMP30/1 accessory printer can also be connected to the colony counter, and results from numerous plates printed out at the touch of a button. As the colony counter has inbuilt statistical functionality, means and standard deviations can be included in the results printout." The SC6PLUS colony counter is supplied complete with one Wolffhuegel graticule, one segmentation disc and two centering adapters for 50 to 90mm petri dishes. A choice of magnifiers is available to aid easier counting of smaller colonies and the receiver dish may be easily removed for cleaning.